Museums have to welcome visitors and members on a daily basis and at times it becomes a challenging thing for the museum staffs when it comes to getting indulged in the check-in formalities of the visitors and the members. Obviously, the queues are different when we talk about the visitors and the members but just to break the mess and make it more hassle-free, museums have started using the Member Fast Lane Kiosk that reduces the time of the staff and the member as well to get the entry into the museum. The tablet kiosk in museum offers a convenient way to let your members enter few details that indicate the museum staff about your membership with the museum. In this way, you can give priority and attention to your members that they deserve and not have them wait in general queue behind people inquiring and buying tickets. How convenient is that! So how does the Member Fast Lane Kiosk Work? Our solution integrates with your Altru, Raisers Edge and other membership systems. Below I have mentioned few of the quick reason that would clearly explain you the need to get a Member fast lane kiosk for your museum. Continue reading…. Fast Lane solution allows your members to gain quick entry without waiting with other visitors. This means there is no requirement to assign an additional person for members. Unlike any other procedure, the Fast Lane Kiosk is a solution on iPad affixed to the counter or the stand. It comes with a companion iPad with Fast Lane for your staff. Not just this, but Fast lane can even show max how many people are allowed with that type of membership and give the analytics to museum staffs as to how many came that would help them generate reports. With the Fast Lane Kiosk, how easily the members get to check-in to the museum without spending long hours in the queue! This is not only helpful in reducing the stress level of the museum staffs but also to promote loyalty that lets your members introduce your museums with other friends and family. Reason being, the check-in formality is so easy and convenient for them. They would appreciate their experience and respect that your museum is using the latest technology to give priority to the members. 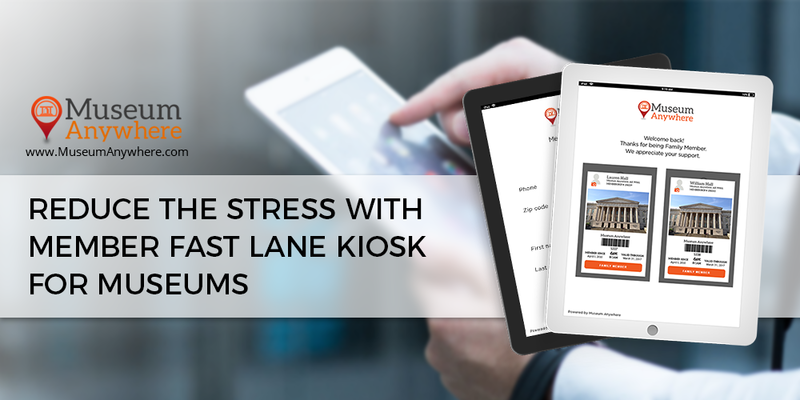 So if you are looking forward to Member Fast Lane Kiosk Solution, then feel free to talk to our expert. Previous Previous post: Reasons why Mobile Wallet Is the Best Place for Digital Membership Cards! Next Next post: The Benefits of having a Science Center App!